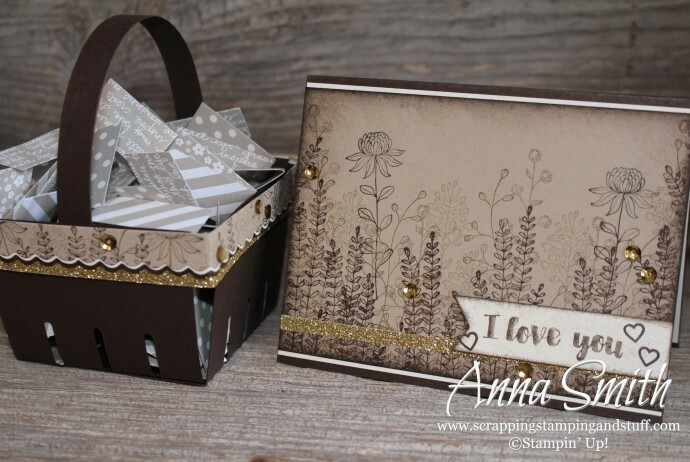 ← New Stampin’ Up! Weekly Deals! Love is in the air! 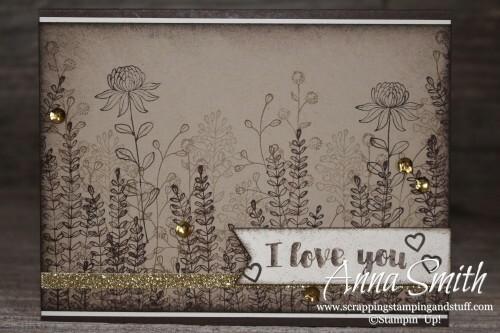 It’s One Stamp at a Time Blog Hop time and this month’s theme is just that…love is in the air. Many of you are arriving from Marisa’s blog. Have you seen some awesome projects so far? Continue reading and hopping to see some more! I chose a subtle love project to feature this month- this card and berry basket set. I designed the card first. I loved how the combination of browns and gold turned out. I stamped the flowers with the Flowering Fields stamp set, a free gift option right now during Sale-a-bration if you make a $50 purchase! The ‘I love you’ stamp is in the Love You Sew set, which is a hostess exclusive in the current annual catalog. 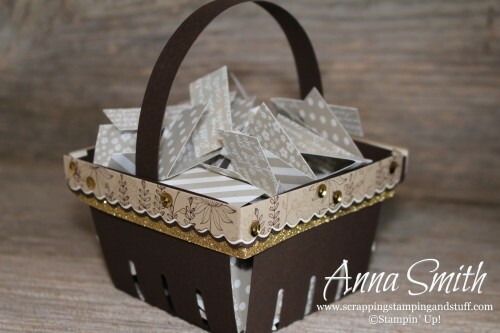 After I made the card, I made this cute little basket to match using our berry basket die. You could fill it up with anything- cookies, candy, or other fun treats, or you can cut strips of paper and write down the reasons you love your Valentine. Fill it up until it’s overflowing! I hope you liked my projects! Thanks for visiting and make sure to click the button below to continue on to Jeanna’s blog! Here are the other hoppers along the way! I just love your projects, Anna! Such a great take on this set–I never would have put the colors together with this set and it totally works! I love your basket idea, too! TFS!! Such cute projects. I love the berry basket. It can be decorated in so many ways. I love what you did and how it’s different from mine. Like the color combo too! I really like your non traditional colours. That basket is awesome. Such beauty with such an unexpected color combination! Love them both! Very unique use of this stamp set – love what you did!!!! not your typical valentine’s colors but oh how they work so well. the touches of gold add just the right amount of wow factor. great job! Really love the combination. Great job! Awe cute basket, and love your card! I love these ! Great work . I absolutely love rustic and vintage! That berry basket is AH-MAY-ZING!! WoW! I lover what you did.. I’ll definitely be casing it! The simplicity of the tone on tone flowers — they’re beautiful. Great card and project! I love the pops of gold on both and the layering of borders on the basket is fantastic! What a sweet gift ensemble! Love the idea of “How do I love thee? Let me count the ways”. Sure makes the Valentine feel special! Beautiful card and basket! Love the gold with the neutrals. i just love your vintage inspired card and gift basket! beautiful work!